It's a bill that would protect pregnant women from harming themselves or their babies in the workplace, but according to the bill's sponsor, the efforts of a lobbying group to stop it forced him to pull the measure until next year. 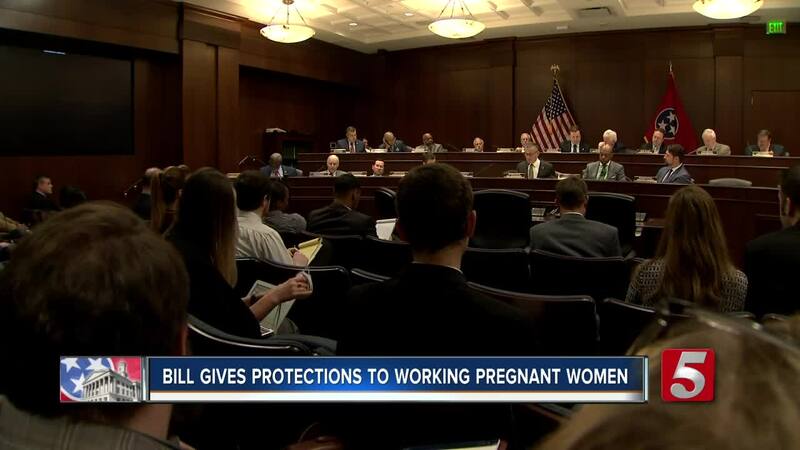 NASHVILLE, Tenn. (WTVF) — It's a bill that would protect pregnant women from harming themselves or their babies in the workplace, but according to the bill's sponsor, the efforts of a lobbying group to stop it forced him to pull the measure until next year. State House Representative Johnny Shaw's bill would've created protections for expecting mothers in Tennessee by requiring employers to make "reasonable accommodations" for mothers based on doctor's recommendations. "So, the doctor might say, I really need you to drink a lot of water to stay hydrated, prevent fainting during your first trimester," said Elizabeth Gedmark. Gedmark is director of the southern office for A Better Balance, a legal advocacy organization. Rep. Shaw and his senate co-sponsor, state senator Jeff Yarbro, want to prevent pregnancy discrimination. "These are women who want to be moms, who want to have their babies who are seeking medical assistance and ask for the mildest of accommodations and they shouldn't lose their job for doing what's right for their children," Yabro said. However, bill was pulled by Shaw after he says lobbyists from National Federation of Independent Business (NFIB) influenced lawmakers. Jim Brown, the state direct or NFIB, said the bill would create avenues for people to bring lawsuits at the state level, when federal law already allows for someone to claim discrimination. He said this would allow two lawsuits for the same incident. Brown said he was happy to talk about a compromise and expected it to pass but the Shaw wanted to work on it for next year. A spokesperson for the Democratic Caucus said Shaw didn't believe he had the votes to move the bill through committee. Pulling the bill allows Shaw to bring it back next year with changes. "Unfortunately, there was not enough time this year to hammer out the important details of this bill--including ensuring robust enforcement. However, we look forward to working with stakeholders in the future on this incredibly important issue," said Gedmark on news the bill was removed from the legislature. Dr. Connie Graves, an OBGYN for Tennessee Maternal Fetal Medicine, said it is an important issue and Tennesseans should want their employers to accommodate women. "Often people will say well if you can't do the job, we don't have anything else for you," said Dr. Graves. "So, you can't work here anymore. What we would like to see is some accommodations to that. Do they have a desk job. Is there a way for the person to remain seated or maybe on a stool during there times at work."